It is critical to recognize that while the TRC mandate related exclusively to the Residential School System, the Colonial Projects executed an intentional genocidal strategy intended to dominate and control the land and exploit its resources. Use this kit as a guide for your organization to read and apply the TRC report. This toolkit will be most helpful for organizations that have already begun the work of decolonization, and understand some of the concepts contained in the guide. A clear understanding of social justice, the social determinants of health, systemic discrimination and anti-oppression will be necessary to fully engage with the content. On June 18 and 19 of 2015, the event Remote Control: Building on Capacity to Implement Community-Based Research in Rural, Northern, and Remote Communities in Manitoba took place in Winnipeg, Manitoba. The intention of this event was to engage in dialogue with three communities in Northern and rural Manitoba, Thompson, Flin Flon, and Swan River, to build the foundations of a community-based research (CBR) initiative. The event was meant as a first step to engage in dialogue with these communities, to introduce key stakeholders to the concept and complexity of CBR and to allow them to network and create relationships with one another and with other community members health professionals, researchers and advocates, to discuss HIV/AIDS related issues and priorities in their communities, and to develop a plan to implement a CBR project in each respective community through a collaborative grant proposal development process. The 595, formerly the Manitoba Harm Reduction Network, is a network of over 100 member organizations interested in preventing the transmission of HIV, HCV and STIs in Manitoba (Sexually Transmitted and Blood Borne Infections: STBBI). made up of 20 peers. This group is involved in discussing ideas about harm reduction and informing programs on best practices. 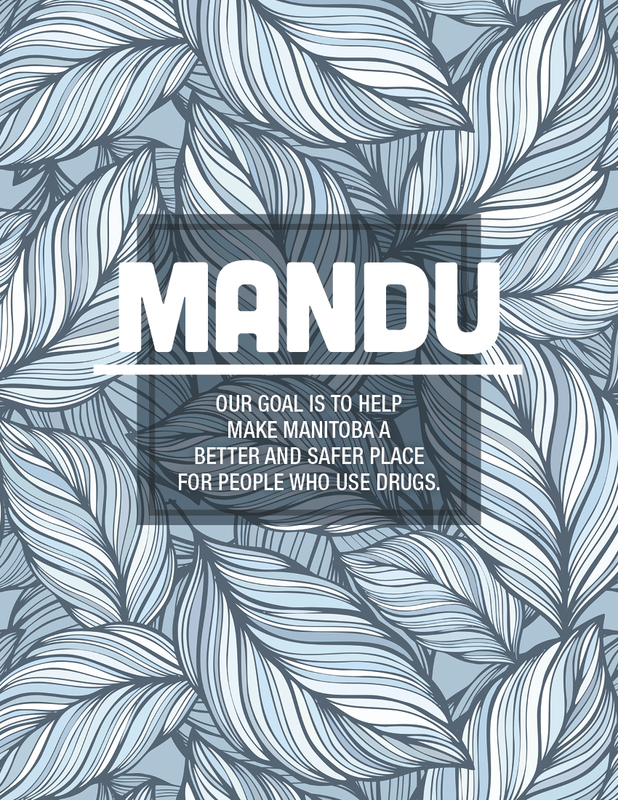 The 595PWG believes that using a harm reduction approach is the best way to support underserved populations and reduce STBBIs in Manitoba. We ALL love someone who uses drugs. In 2017 The MHRN launched the I (heart) Someone Who Uses Drugs Campaign. This campaign was aimed at reducing the stigma associated with people who use drugs and was integrated into our training materials, events, and organizational messaging. The idea is that anyone could wear this t-shirt, because we all love someone who uses drugs. To date, over 500 T-shirts have been distributed to peers, service providers and anyone who loves folks that use drugs! Pins and stickers were also distributed at Overdose Awareness Day, Substance Use Awareness Week, and through our network partners ant their events. If you are interested in purchasing t-shirts for an event, or picking up pins and stickers get in touch with the coordinator in your area to see if we have any available. We Love You, Be Safe. In preparation for a spring and summer full of new visitors, the Peer Working Group, a Winnipeg-based advisory council of people who use drugs, decided that they wanted to share information about the neighbourhood they call home. Specifically, information that could help other people impacted by substance use to be safer, more connected, and to raise awareness about current resources. With support from the Manitoba Harm Reduction Network (MHRN), the Peer Working Group completed the project “We Love You, Be Safe: A Harm Reduction Map of West Broadway”. Peers identified that they wanted to develop documentation about their work, values, and how service organizations can meaningfully engage them. 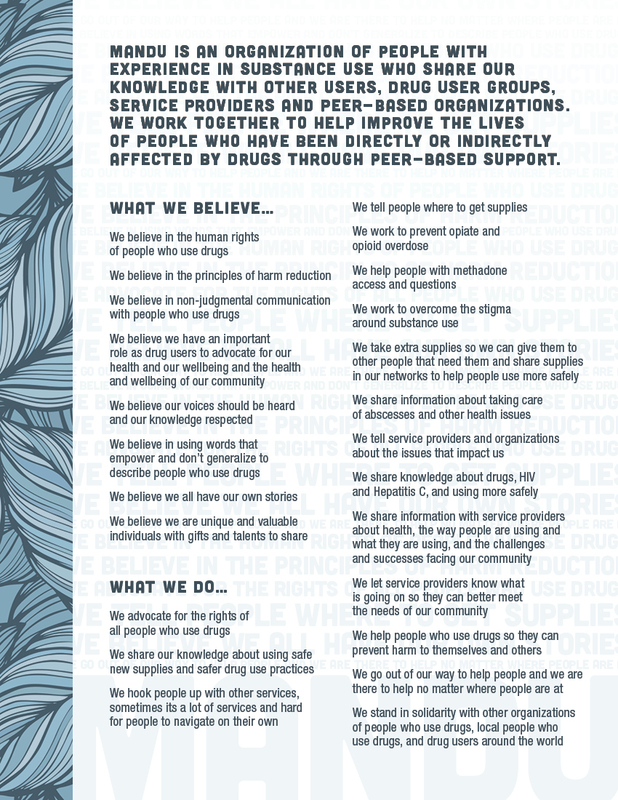 For this project the Manitoba Harm Reduction Network and several peer-based organizations set to work creating visioning manifestos, and researching how that process impacted their organizations. Peers found it helped them and their organizations in several ways including decreasing stigma and as a tool to guide their work. 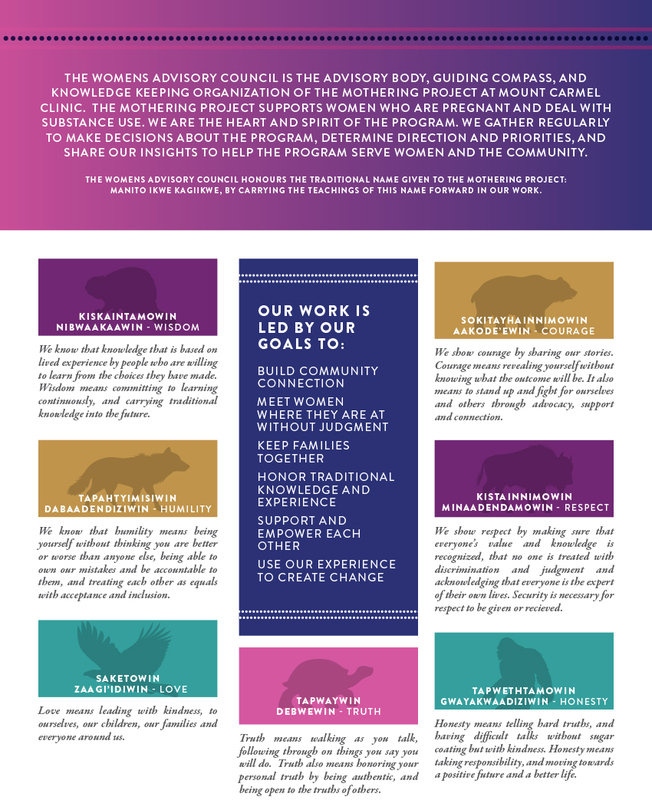 This resource was developed In partnership with the Spruce Woods Sundance Family and Ka Ni Kanichihk, and the Manitoba Harm Reduction Network. The leaders and helpers at ceremonies, like the Sundance, have created this brochure to inform healers, helpers, dancers, and those who participate in healing ceremonies.